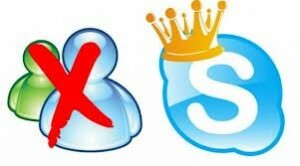 To facilitate the transition of users to Skype, Microsoft has added an upgrade icon on your desktop Messenger, which, if clicked, removes Messenger and installs Skype on your computer. Until March 15th 2013, Messenger will work properly. This instant messaging service was launched as MSN Messenger in 1999, and later renamed to Windows Live Messenger. It is estimated that was used from about 300 million users each month across the world. China is the only country in the world where the Messenger will continue to operate after March 15 due to a special agreement between Microsoft and the Chinese government.